Avid collector, Andrew Hawley from Vintage Rock Posters, announces his search for original 1972 Portland Memorial Coliseum Led Zeppelin concert posters. Over 12,000 heavy metal fans got to enjoy almost 2 and half hours of music that night. Over 12,000 heavy metal fans got to enjoy almost 2 and half hours of music that night. Avid collector, Andrew Hawley from Vintage Rock Posters, announces his search for original 1972 Portland Memorial Coliseum Led Zeppelin concert posters. Over 12,000 heavy metal fans got to enjoy almost 2 and half hours of music that night. The concert was held on June 17. According to Hawley, “The show promotor was Concerts West. Trane Printing Company printed the posters for the Portland show. They were 14 x 22 inches. The same concert poster was used to advertise the 1972 Tucson and Seattle Zeppelin shows. 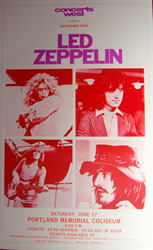 Concerts West also arranged Zeppelin shows in the Southern and Eastern U.S.” For an example of Led Zeppelin boxing style concert posters, go to http://www.vintageconcertposterbuyer.com/boxing_style/led_zeppelin.html. If you have an original Portland Memorial Coliseum Led Zeppelin concert posters, Hawley is willing to pay $3,000 cash for each concert poster. He is also seeking authentic 1969-1972 Zeppelin concert posters. Please call 310-346-1965 or email andrew (at) vintageconcertposterbuyer.com.